The symmetry on the triangular tree(?) is making it look like something artificial. It's better to avoid symmetry with trees like that - trees are only vaguely symmetrical, and they look more natural without symmetry. The two dithered trees feel rather noisy. Don't forget that black and white are also valid values you can use! Don't be afraid to have solid black and white parts. 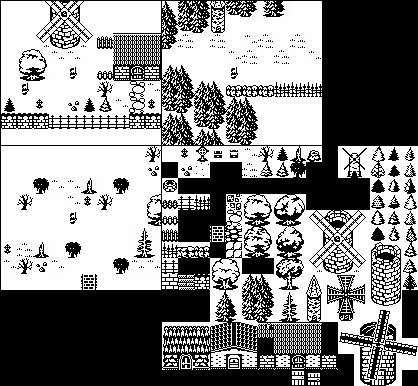 In those parts where you do mix black and white pixels, I think it might be better to focus on showing clumps of leaves/branches rather than individual leaves. At this scale, tiny details just read like noise. Pet peeve alert: That's a fir (or maybe a spruce), not a pine. 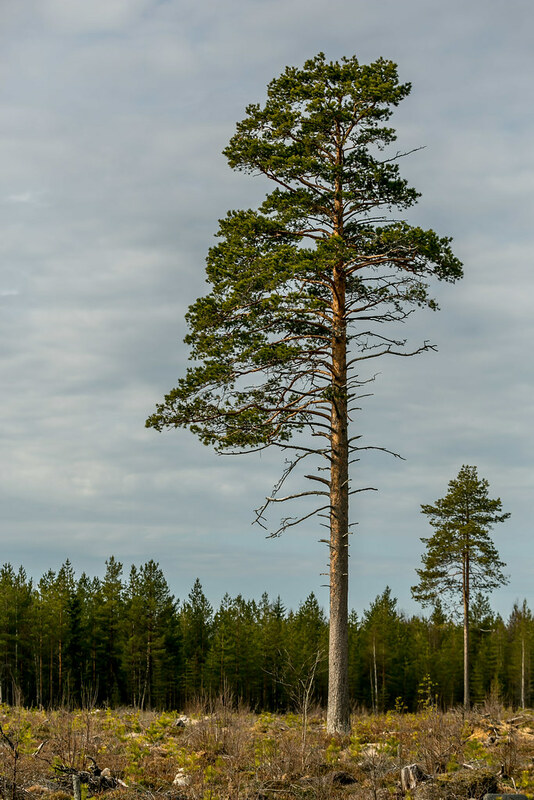 This is a pine. In any case though, it's still symmetrical. I meant the tree that's not a silhouette, that one was fine. I meant the dithered one that is literally symmetrical, down to the pixel level. The two silhouette trees were fine. Sorry for being unclear before! Single pixels might sometimes be unavoidable, but noise is always avoidable. If you have pixels that don't read like anything, that's noise, and it doesn't belong. Pixels that read as texture or details are not noise. 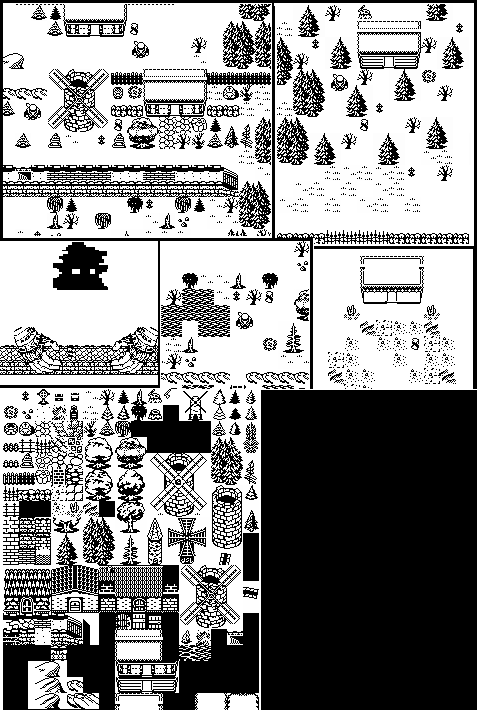 However, for that to happen, they need context, larger clusters of pixels establishing the context to which those single pixels add texture/detail. If everything is detail, then there's no form, and therefore it doesn't read. I didn't use any dithering because I feel it's unnecessary at this size, but that's not to say you can't or shouldn't. 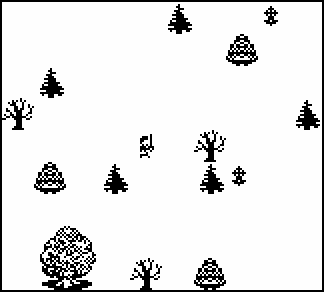 I also made that one dithered tree asymmetrical while I was at it. ^Great edits for the trees. I also like the characters. Very small but also recognizeable. Then made my own -- is this an improvement any? I tried to fill in more rather than dither here - are these results better/readable? I recommend redoing the big tree yourself instead of using so much of my edit. I chose an arbitrary light source, which doesn't necessarily match the lighting you want to have on everything. I don't mind you using it, but I think you'd learn more by doing it yourself. I think those smaller trees are definitely going in the right direction! Their forms are more readable than the old one, for the most part. You can do the same thing for other trees, just with different shapes. 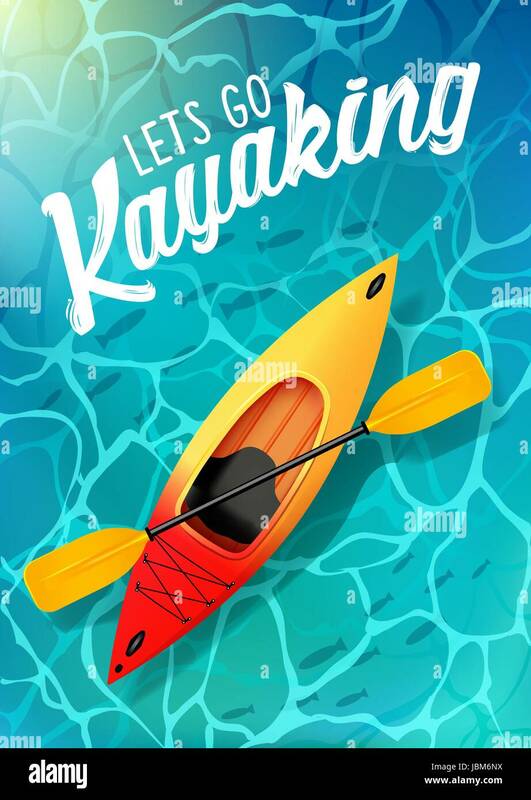 The rounded walls don't read as rounded to me, but I think it's because of the perspective mismatch; the actual pixelling on them looks nice and readable, it's clear that the middle part is meant to pop. The walls have a flat top and bottom (as opposed to rounded), which suggests they're flat. A rounded wall would only have a flat top and bottom when viewer from the front (e.g. 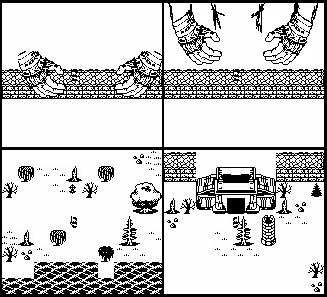 like in a side-scrolling game), but your layout suggests more of a top-down view. This is an issue with a lot of the sprites, but it's less noticeable on them because they're too small for the rounding to be prominent even if it was there. The house and trees are in different scales. The door is about the same size as the smaller trees, which means the trees are person-sized. If you go for a more symbolic look that can be fine, but judging by the level of detail and the fact that you have larger trees, you're going for something a bit more realistic. In that case, your single-tile trees should be young trees and bushes, not miniature mature trees. The large tree in the right mockup is lit from below, unlike everything else.